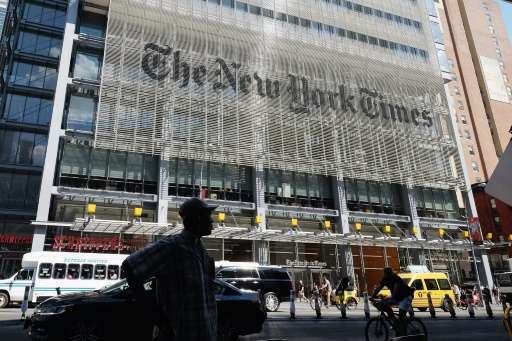 Hackers with apparent ties to Russia have conducted a series of cyber attacks on US media outlets including the New York Times, CNN reported Tuesday. The FBI and other US law enforcement agencies are examining the breaches, US officials told CNN, and investigators believe Russian intelligence is likely to be behind the hacks. The FBI did not immediately respond to a request for comment, and a New York Times spokeswoman did not confirm the investigation to CNN. According to CNN, investigators think the latest hacks are part of a broader of series of attacks that also targeted Democratic Party organizations. Hillary Clinton's campaign has accused Moscow of hacking into Democratic National Committee emails. CNN said Russian hackers are also believed to be attempting cyber attacks on Washington's many think tanks, which frequently employee former government officials to provide expert analysis on national security issues. Cyber vulnerabilities have become something of a crisis in the US government. The head of the Office of Personnel Management was last year forced to resign after her agency suffered a massive hack—which many suspect originated in China—that affected a staggering 21.5 million people. Even America's top cyber snooping organization, the National Security Agency, is in the midst of a hacking scandal in which it appears some of its top secret code was leaked or stolen. Not sure why this is news anymore. All computers are insecure. If someone wants in, and they've got the time, patience, and cleverness it requires, they're getting in. Even if you secure networks with quantum encryption, the endpoint computers themselves, and especially the humans that use them, are still vulnerable to various exploits and manipulations. The FBI can investigate all they want. They won't stop China or Russia or anyone else for that matter from getting into systems using exploits they've found that nobody else is aware of yet. What're they going to do, politely ask them to stop? Educate end-users on ultimately futile security practices? For every exploit fixed, there are dozens more discovered. To write anything close to -actually secure- code seems to require more time, money, and expertise than software company profits allow for. All software developers would have to be PhD computer scientists, and that still likely isn't enough. I'm sick of American fascist propaganda claiming that Russia is responsible for all evils in the world. When the rest of the world knows that it is the USA, or rather, it's oligarch class... which has blown the world to pieces, and has now blown the USA itself to pieces. Multinational corporations as cover stories for old school fascist oligarchy. Just like this blame shifting finger pointing 'CNN hacked' crap. Over time, 85% of USA journalists were fired after the USA struck down truth in news via allowing the renaming of news corporations as "entertainment". Thus propaganda was legally enabled. The +250 corps now share created stories as rubber stamp repeats. I guess this is what you get when the university of Oregon does a study and shows that 95% of all US mainstream media is owned by ~250 organizations, which are controlled by 6 people, whom all pray at the same temple. Literally. There are no fibs or exaggerations in this post, nor rants. Research the claims.